I don't have the horseback riders name but the clown is none other than Jack LeClair, creator of several classic gags including Blowing Up the Fat Man, and father of Jackie LeClaire, himself a longtime fixture of the Alley of the Ringling Bros. and Barnum & Bailey Circus and (I recently found out) the toast of Paris when the Ringling show played there in the 1960s. 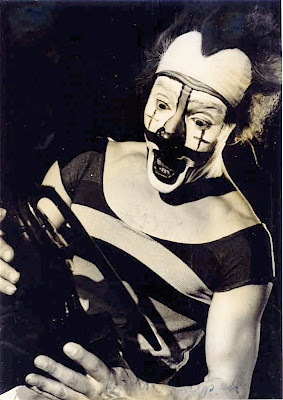 Unidentified clown holding what looks like a figure skate. Glen "Kinko" Sunberry performing his midget car entrance and the contortion act with a barrel that he performed first in vaudeville and then in circuses beginning in the 20s and going all the way up to the late 60s. I don't know what became of his "Squat Car" but the barrel was purchased by Bill Ballentine after Kinko retired and brought to Clown College in Venice, FL. In 1974 Lou Jacobs gave it to Mitch Freddes, who has performed with it ever since using it on the Ringling Gold (Hometown) Unit as recently as just a few years ago. I apologize for having to chop this into two parts. The act runs almost 12 minutes, which is two minutes longer than YouTube allows, so I had to cut it. Performing some different material that we've seen them do with Milton Berle; Johnny Puleo and the Harmonica Gang on Hollywood Palace, December 31, 1966. 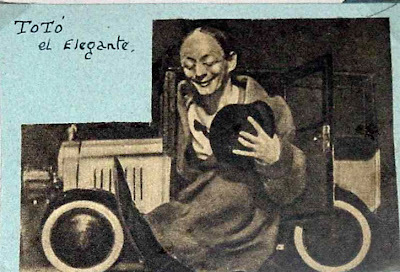 Marcelo found this photo of famous Viennese clown Toto in a collection of photos from a Spanish scrapbook. Here we see the clown who seems to have developed the idea that Lou Jacobs later perfected with his famous midget car gag. It's easy to imagine that Lou might have seen this act in vaudeville back in Germany, when he was part of an acrobatic act in those "musik hall" days. Interesting to note; in Toto's case, the car didn't run on its own, but it was pulled on stage by an assistant on the other side of the wings, via the very practical method of... pulling a rope. Of course, Lou Jacobs polished the original idea by giving the car an engine, and a complete routine to go with it. Toto seemed to have just used his for an entrance. Many other clowns after Lou used the midget car in much the same way Toto did, as an entrance. Bobo Barnett, Kinko Sunbury, Mark Anthony, Hip Raymond, Frankie Schmitz... a great prop that circus audiences have come to expect but rarely see today. 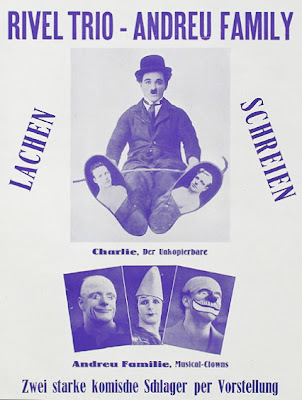 A page from a 1927 German circus program that shows photos of the Rivel Trio and Andreu Family featuring Charlie Rivel's uncanny Chaplin impersonation on the trapeze. Very interesting to take a look at Charlie Rivel's original auguste makeup (in the lower right corner), quite different from the one we all know, but keeping with the same idea. But I notice he didn't include any pictures of THAT face in his autobiography! Members of the Clown Alley of the 120th edition Blue Unit of the Ringling Bros. and Barnum & Bailey Circus. This segment is hosted by Greg DeSanto and features appearances by Jon Weiss (Ladder Balance and Vet Gag), Huel Speight (Juggling), Tom and Tammy Parrish (Pass Juggling and Proud Parents) , Chris Allison (Ball Spinning and "108"), David Kiser (Laughing and Aardvark Owner), Marge Talavera (Stuffed Into a Road Box), Kevin Thompson (He Who Gets Slapped) and Scott Linker (Gas Mask). 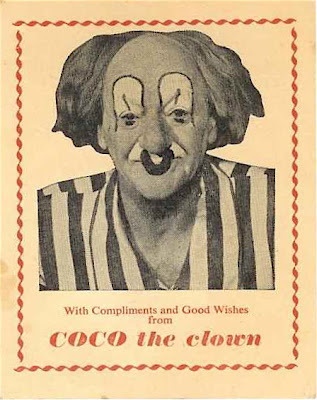 You have now been properly complimented and goodly wished by the famous star of the Bertram Mills Circus, Coco the Clown. 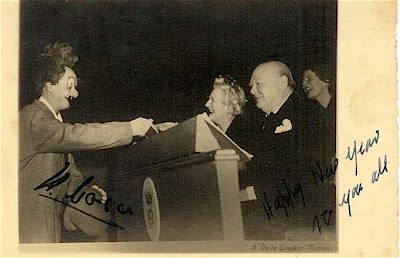 Nicolai "Coco" Polaikovs (or Poliakoff) with British Prime Minister, Sir Winston Churchill. A compliment to my earlier post featuring Johnny Puleo and the Harmonica Rascals performing with Milton Berle on Texaco Star Theater in the late forties, here's Berle with Puleo and the Hamonica Gang on Hollywood Palace in the mid-sixties. I can't take credit for presenting this one, although I wish that I could. I've got two copies of this scene from the 1939 film SEEING RED, each with a flaw. I was hunting down a new copy when I saw that someone had beaten me to the punch and posted it to YouTube the other day. Ladies and Gentlemen, in one of only two known film appearances, it gives me great pleasure to introduce the extremely inventive Mr. A. Robins, originally known as the "One Man Music Shop" or "The Walking Music Shop" and later simply as "The Banana Man". This is not Sam Levine, the man who later presented the same act (with the same props) on television from the 40s through the 70s, this is the original Banana Man himself. 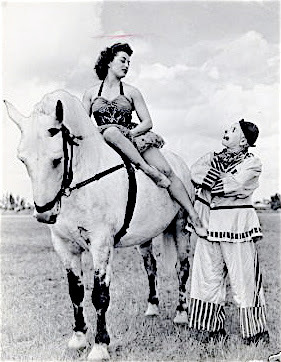 Mr. Robins was the featured clown on Ringling's 1943 Madison Square Garden spectacular entitled Spangles. For more on A. Robins, Sam Levine and the Banana Man act please click the title of this post. A man named A. Robins started doing his odd act in the days of vaudeville, occasionally venturing into circuses. It was an act that basically consisted of him taking things out of his pockets and using his voice, sometimes with the aid of a kazoo-like device, to provide the sounds of musical props. In most appearances, he'd drop the items he produced into a large chest which would eventually turn into a train — sometimes with many cars — and he'd ride it off stage at the end. Originally, the act was called "The Walking Music Shop" but he spent so much of his on-stage time finding stalks of bananas in his pockets that he came to be known as "The Banana Man." 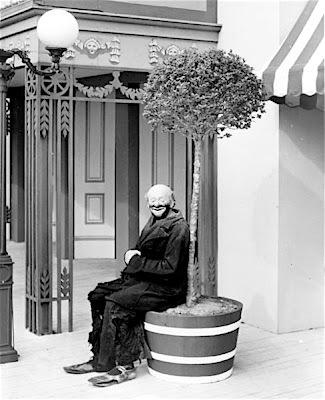 Mr. Robins, who was also a toy and propmaker, performed his unnatural act until around the end of World War II. In the fifties, The Banana Man was a frequent guest on all the live kids' shows of that era (Howdy Doody, Mickey Mouse Club, Captain Kangaroo, etc.) and even on variety shows for adults, including Ed Sullivan's. By this time, the act and its unique props were in the hands of a man named Sam Levine, though he was never billed as anything but The Banana Man. Once in a while, he was even billed as "A. Robins, The Banana Man," even though the first A. Robins — whose real name was Adolph Proper — passed away around 1950. Among folks who study such matters, there is some argument as to whether someone else (or maybe even several someone elses) performed as The Banana Man after the act's originator sold it off and before Levine assumed the role. In any case, Levine was the guy I saw on all those shows and he was mesmerizing. I couldn't take my eyes off this odd man when he was on TV. Neither could most of my friends, and we all tried to mimic his bizarre, high-pitched humming, sometimes merging it with impressions of Curly Howard. He seems to have retired in the mid-sixties but his haunting song lingers on. The following clip is introduced by a youthful Red Skelton. It's from a 1939 short film called Seeing Red, and it's one of the few times Robins performed on film...and as I said, it's a very short version of what he did on stage. In fact, he doesn't even get around to producing any bananas. Oddly enough, although Sam Levine did the act on hundreds of TV shows, clips of him are equally hard to come by. Congratulations to each and every one of our winners as well as our many nominees. You are the beacon that lights the way to American circus clowning in the 21st century. Incredible footage posted to YouTube by a family member of the man they knew as "Uncle George" back in the 60's practicing in their front yard in Mineral Ridge, Ohio. In this video we see him demonstrating both his manipulation skills as well as the acrobatic abilities he'd learned and honed while circus clowning as a younger man. Ladies and Gentlemen, the polls are still open and votes are being taken for the 1st annual Felix B. Adler Awards for American Circus Clowning. Votes will be accepted today, right up until kickoff. Winners will be announced here today during halftime of Super Bowl XLI. A promotional video for one of the most unique theatrical experiences I've ever been witness to, Fred Garbo's Inflatable Theater Co., starring Fred Garbo and Daielma Santos. Fred is not only an inspired performer but is also a wonderful teacher, having taught at Ringling Clown College, Motionfest and Minifest.